We at Gaoyuan are an ISO9001:2000 certified asphalt plant manufacturer, based in China. As shown in the above pictures, we offer customers several types of asphalt plant, including asphalt emulsion plant, modified asphalt plant and intelligent asphalt rubber plant etc. Please click on the specific product you are interested in to find more detailed information. 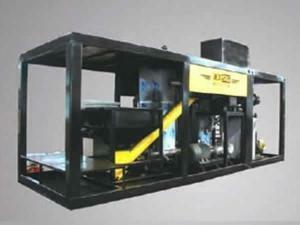 GYRY10A asphalt emulsion plant is our newly developed asphalt emulsion equipment that has won national patent (patent No. 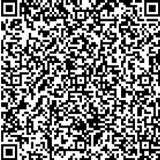 ZL00226275.4.). 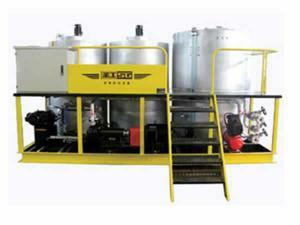 It is designed to produce emulsified asphalt for use in express highway construction and road maintenance projects. 1. Our asphalt emulsion plant is settled on a foundation, which is convenient to remove and suitable for working in the field. 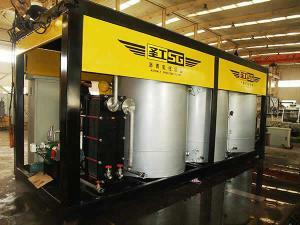 It can be equipped with a water heater or HTF coil heating device to heat the emulsion on the construction site. 2. This asphalt emulsion equipment uses an automatic control system to automatically monitor and regulate asphalt content in emulsified asphalt. 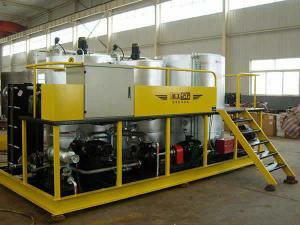 In addition, it adopts two emulsion tanks to mix the materials and drain water in turn for continuous production. Compressed air drives fluid flow which is governed by the pneumatic valve, thus reducing labor intensity. 3. A high efficiency plate heat exchanger is first used to cool the finished emulsified asphalt so as to improve emulsified asphalt storage stability, and then used to heat the cooling water for producing emulsified asphalt, which saves clear water heating expense for lower production cost and makes the process environment friendly and energy saving. 4. The rotation speed of the asphalt pump is controlled by a frequency governing motor, and the emulsion flow rate is regulated by a valve (displayed by the flow meter). Therefore, asphalt content in emulsified asphalt (ratio of asphalt to water) can be accurately and stably controlled. 5. HTF heating system is equipped to warm all the pumps before production, which is easy and convenient to replace baking with blowtorch. 6. The temperature of HTF heating system and water heating system is automatically controlled. 7. All the parts that come into contact with the emulsion are made of qualified stainless steel, which are wear resistant and corrosion resistant, ideal for emulsified asphalt production. 8. The emulsion fineness is less than 5μm. 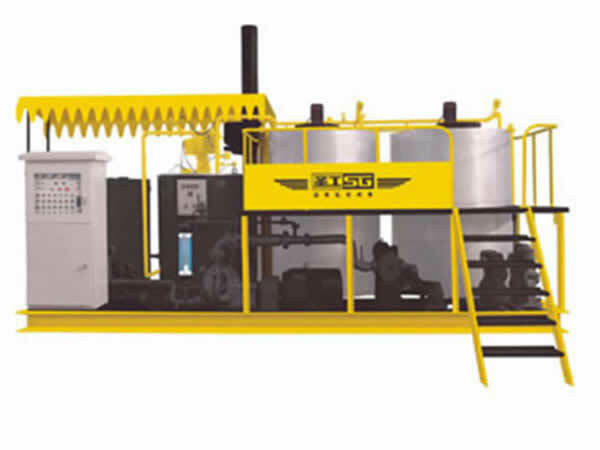 As an experienced asphalt emulsion plant manufacturer in China, we at Gaoyuan also supply micro surfacing paver, asphalt distributor and other road maintenance machines, in order to satisfy all customer needs. Because our products are reliable durable and economical, they are CE, CCC certified and in great demand by customers in Poland, Russia, Papua New Guinea, Indonesia, Vietnam, Kazakhstan, among other countries. With years of experience in the field, we at Gaoyuan know how to produce a quality asphalt plant. Raw materials and key components of our products are purchased from qualified suppliers. In addition, we have established a specialized quality control department to strictly monitor each production detail. We also provide our staff with continuing training to improve their skills. All these factors contribute to the quality of our asphalt plants. As a result, our products are CE, CCC certified, and are extensively used in the manufacture of asphalt. In addition to asphalt plant, we at Gaoyuan also offer asphalt distributor, synchronous chip sealer and other products, so as to satisfy all customers' demands. As our products are reliable, durable and easy to operate, they are well received in many countries, like Poland, Russia, Papua New Guinea, Indonesia, Vietnam, Kazakhstan, Kyrgyzstan, Nigeria, Angola, Congo, to name a few. Backed by our large production capacity, we can fill customers' orders quickly, usually, within 20-30 days. OEM service is also available, upon request. Thanks for your visit to us. We look forward to hearing from you.